One of the best motoring events on the planet is only a short flight away from NI. This year for the first time I made it to the Goodwood Festival of Speed near England’s south coast, held on Lord March’s sprawling estate, and I was blown away by this automotive extravaganza. 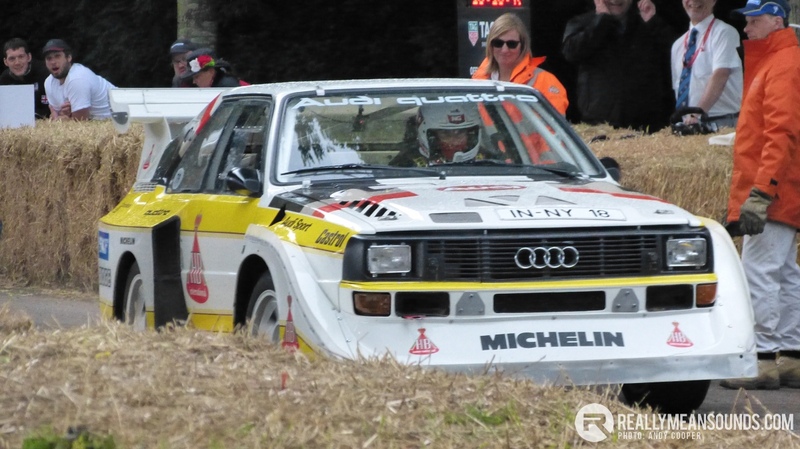 Originally billed as a hill climb, Goodwood FOS brings together all ranges and diciplines of motorsport, cars and bikes, from F1 to Ken Block to Vintage and all in between. There’s live action up the hill where supercars could be followed by 1930s racers. All the major manufacturers appear with their performance cars on extravagant stands, along with thousands of the most rare, expensive and unique vehicles from around the world. Every A to Z-lister celebrity that has even a tenuous connection with motoring goes. And it’s that popular, they have to cap the public entry to 150,000 over the weekend. The Goodwood Estate is enormous occupying some 12,000 acres, and on our approach in the queues of traffic it was clear this was an event like no other. At one stage we were surrounded front and rear by £400k of Lamborghini. 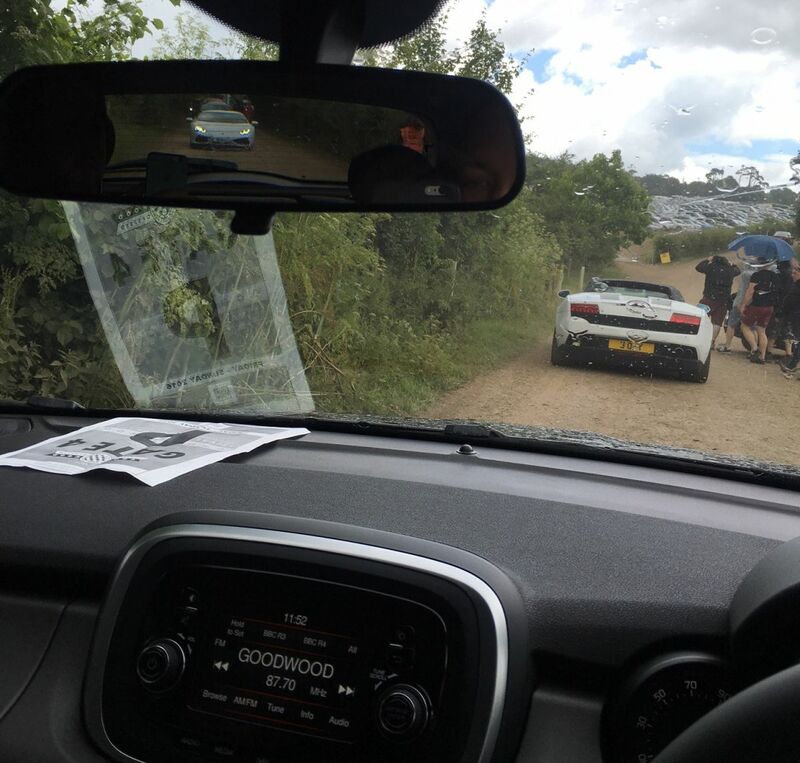 In fact, our Fiat 500x hire car was unique in being one of the few ordinary cars in the supercar traffic. Then the Red Arrows flew overhead as the official Goodwood radio station (below) kept us up to date. They were also broadcasting live on Facebook. Some operation indeed. Our challenge on entry was simply deciding where to go first. The hill climb is of course the central attraction, and this is surrounded by the various displays and stands. First up was the open paddock with many of the hill climb racers, either sitting pretty or in the throes of an engine overhaul after a smokey first run. This could range from GT40s, to the Mercedes W125 (the 725bhp speed record holder built in the 1930s) to dragsters and both current and past Formula 1 Cars . This really set the mood, with a cacophony of engine noise and enough fumes to raise the pulse of any enthusiast. The A-list cars above were equally matched by the A-list drivers, with the likes of Grey’s Anatomy’s Patrick Dempsey running a Porsche up the hill. Ken Block took his Gymkhana Fiesta up the hill. Jenson Button, Mark Webber, Stirling Moss, Matt Neal, Gordon Shedden… even self-confessed petrolhead Keanu Reeves was taking a bike up! I’ll let Goodwood’s footage tell the story, with Olly Clark in the Impreza “Gobstopper 2” taking the win with a 46.29s run, showing a clean pair of heels to the likes of a McLaren P1 LM! US Drift Series Forumla-D driver Vaughn Ghittin Jr took on some grass tracking in his 800bhp+ Mustang leaving his rear bumper in bits. Manufacturers were out in force, bringing the very best of their performance brands not simply to languish in their pop-up showrooms on the estate, but of course to be run up the hill. I’d seen the new NSX at the Geneva Motor Show earlier this year, but witnessing it being thrashed up the hill was considerably more entertaining. Kudos to Honda also for by far the most memorable stand of the event, built in the style of a Fisher Price garage, evoking the earliest of childhood motoring memories. Mercedes had brought along their latest SLS-platform beast, the AMG GT R, in shocking green. Unveiled on the Friday by no other than Lewis Hamilton, it’s a 570bhp V8 monster and was run up the hill on Saturday no doubt in an attempt to woo the many Porsche GT3 owners in the crowds. Speaking of Porsche, their current line up is compelling if you have the wallet for it. Four cylinder cars aside, the new Carrera 4S is a thing of beauty and turbocharged out of the box, along with the stunning 918 Spyder below. I couldn’t continue the German theme without mentioning BMW. Their M avenue fronted by M4 GTS and M2, also contained some of the M greats from yesteryear including the E46 M3 CSL, 2002 Turbo, a Z3 M Coupé and even an M1. You can see many of the others in the photos, including VW’s stand celebrating 40 years of the GTi, and JLR’s off road experience. Stunt driver Terry Grant took to the hill on two wheels in one of their F-Pace SUVs, and it repaid him by tarnishing his unblemished reputation ending up sitting on its doors! 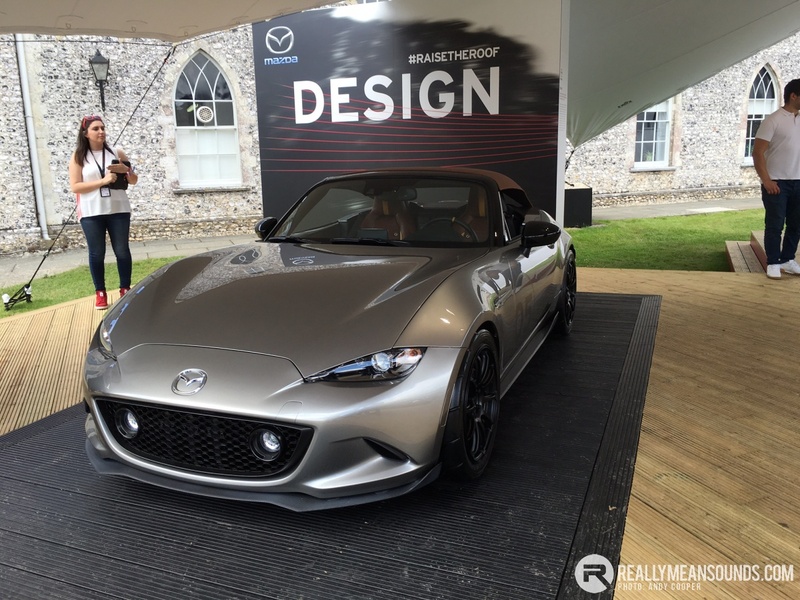 Mazda’s chilled out bandstand had a bar, live Jazz and their stunning Spyder concept. This one we really hope makes it to the production line! Like this article, your first trip to Goodwood will probably miss out several parts of the event. You need several days to even attempt to take in what’s on show, and for us enthusiasts I can’t think of a better motor show anywhere. We flew with Ryanair from Belfast International Airport to Gatwick. At only £30 return it helps keep the budget under control. Goodwood Festival of Speed tickets are about £60 per day, or about £150 for the weekend. Absolutely unreal, what a fantastic experience. Serious machinery. You had a good spot on the hill climb too. I should have a few more pics and videos I'll stick up. Yip it's a great use of a weekend alright, 5 of us went over this time (been a few times already). Enjoyed Sunday afternoon time attack especially. Tickets booked for next year! What route did you boys take to get there? Fly into London, drive a gentle rental down?